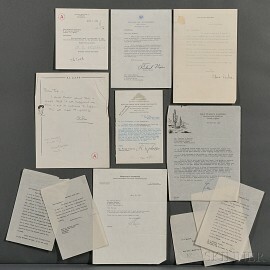 Six typed letters signed by the following: William Carlos Williams (1883-1963), 2 March 1954, submitting his poem, "The Turtle" to the Atlantic Monthly; Richard Nixon (1913-1994), as Vice President, 19 November 1957, thanking Caskie Stinnett for sending the 100th anniversary edition of the Atlantic; Edna Ferber (1885-1968) 22 March 1923 apologizing for not having written a story mentioned by her correspondent in a previous letter, and stating, "I've a horrible feeling that you've managed to confuse me with some one else. Because I can't remember a Harold Weston. And I don't know a thing about his studio. And who is Mr. Schwab? Have I lost my mind?" and expressing interest in writing a piece for the Atlantic; Robert Underwood Johnson (1853-1937) 29 September 1933 to Ellery Sedgwick, expressing dismay that the "Institute" would like to elect H.L. 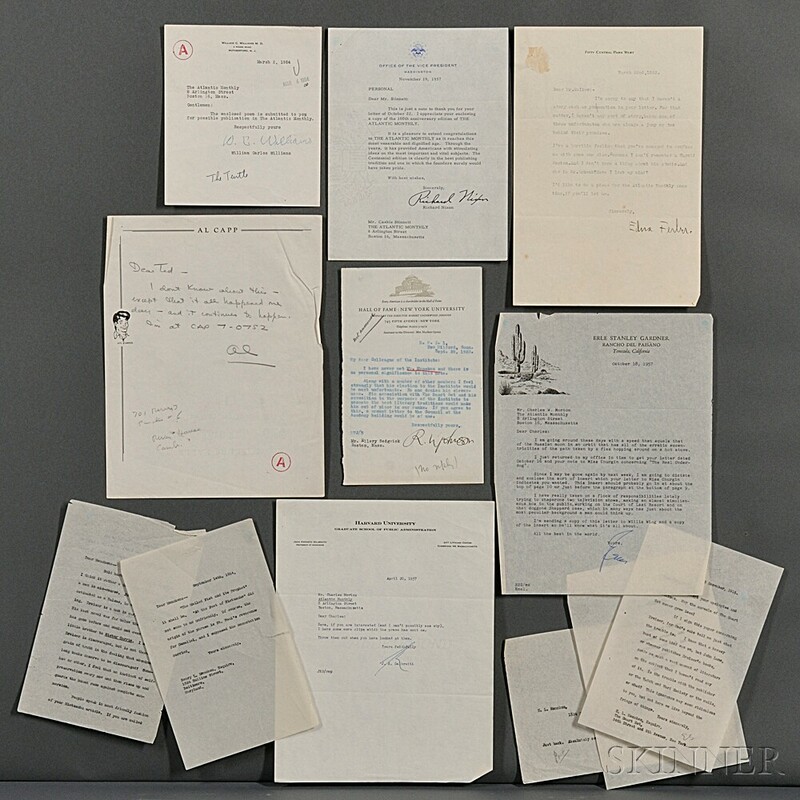 Mencken as a member; Erle Stanley Gardner (1889-1970) 18 October 1957, to Charles Morton at the Atlantic Monthly, promising to send an insert to "The Real Underdog," and discussing his other projects; and John Kenneth Galbraith (1908-2006) 20 April 1957 to Charles Morton sending press clips (not present). One autograph letter in pencil signed by Al Capp (1909-1979), undated, on Li'l Abner stationery, giving his phone number and with the cryptic message, "I don't know about this- except that it all happened one day- and it continues to happen." [and] Five retained carbons of typed letters 1914-1917 from Ellery Sedgwick (1872-1960) to H.L. Mencken (1880-1956) concerning the editing of Mencken's work.